Beneficial (“good”) intestinal bacteria promote health, discourage the growth of disease-causing (“bad”) bacteria and pathogenic fungi, and improve the balance of microbes which normally inhabit our intestines. Many beneficial bacteria transform naturally occurring sugars, especially lactose, into lactic acid, promoting a more balanced and stable intestinal environment. As one of the most abundant sources of lactose is milk, these beneficial bacteria have been used for thousands of years to produce yoghurt, cheese, and fermented milks. Both science and folklore support the healthful roles of these foods. 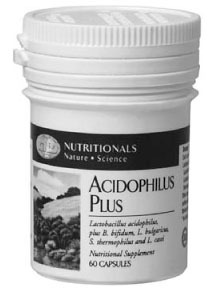 GNLD’s supplement of beneficial bacteria, Acidophilus Plus, combines potency with technology to guarantee that live organisms survive the stomach acid and reach the intestines to deliver five billion viable organisms capable of supporting optimal digestive tract function. Beneficial bacteria help maintain a healthy balance of a variety of microorganisms in the intestines. Beneficial bacteria help produce vitamins and, through an indirect mechanism, boost resistance to infection and disease. Cultured dairy products (yoghurt, cheese, fermented milks), produced through the actions of beneficial bacteria, have been used throughout the world for centuries to support health. Whole-food-derived. Contains beneficial bacteria isolated from cultured dairy foods to support a healthful balance of microorganisms in the gastrointestinal tract. Broad-spectrum. Delivers five types of beneficial, lactic acid-producing bacteria: Lactobacillus acidophilus, Lactobacillus bulgaricus, Lactobacillus casei, Bifidobacterium bifidum, and Streptococcus thermophilus. Concentrated. As many beneficial bacteria as 10 servings of yoghurt or five servings of acidophilus milk! Potency guaranteed. Each capsule is filled with five billion live organisms and protected for delivery to the intestines. Active cultures. Exclusive Gel-Guard protection system assures that the maximum number of live bacteria survive the stomach acid and reach the site of action, the intestines. Convenient. Each bottle contains a 60 day supply.